You know those things in your life that you can’t live without, but didn’t know it? That one day you thought, “How did I get this far in life without _________?” Well for me that’s goats. I think my parents and family still laugh about it. I’ve heard my mother say more than once, “I never thought when I dropped you off at college that you would one day be milking goats.” Me either, Mom. And I know it all sounds a bit like a strange love story, but when I’m with goats I feel I have found my purpose. Spending time here in Oregon and learning the ins and outs of a dairy has only furthered that conviction. When I planned this trip we knew goats would be involved in Forager Farm in some way, shape or form, but exactly how we were unsure. As I milk 40 goats or muck out the kidding pen or do the endless cheesemaking dishes (cheesemaking is 90% dishes and 10% cheese), I’m wondering…how does this all fit? There are many factors to consider, but as with any new business or product you have to look at where the demand is. 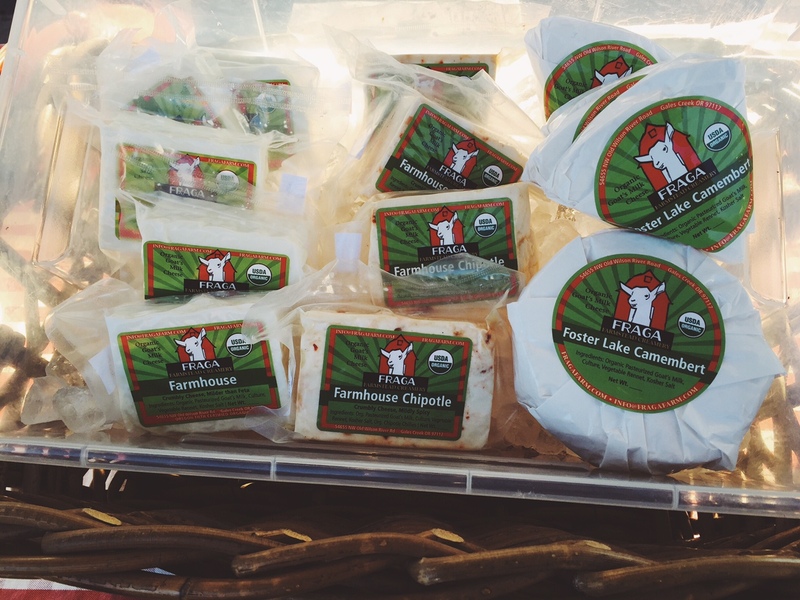 At most grocery stores in ND you can find goat cheese. Not the greatest, small batch, local goat cheese, but goat cheese nonetheless. What you can’t find (with the exception of maybe one brand) is goat’s milk. Ever since any word got out that we owned milk goats, the inquiries on how they can buy goat’s milk haven’t stopped. It’s in high demand. And so far, my favorite days are not spent in the cheese room, but rather in the barn or milking parlor with those sweet, sweet goats. I have however found a new, expanded love for chèvre and could definitely see that as a product of Gypsy Goat & Forager. Yogurt and ice cream also pique my interest, but at this point it’s only dreaming and dreaming never hurt anyone. Jonathon did mention he could be the cheesemaker and I the goat handler…I think I should get that in writing. So what does Forager Farm want to be when it’s all grown up? Diversified. A whole diet CSA of sorts. Vegetables + eggs + sourdough bread + dairy + honey + pork, to name a few. 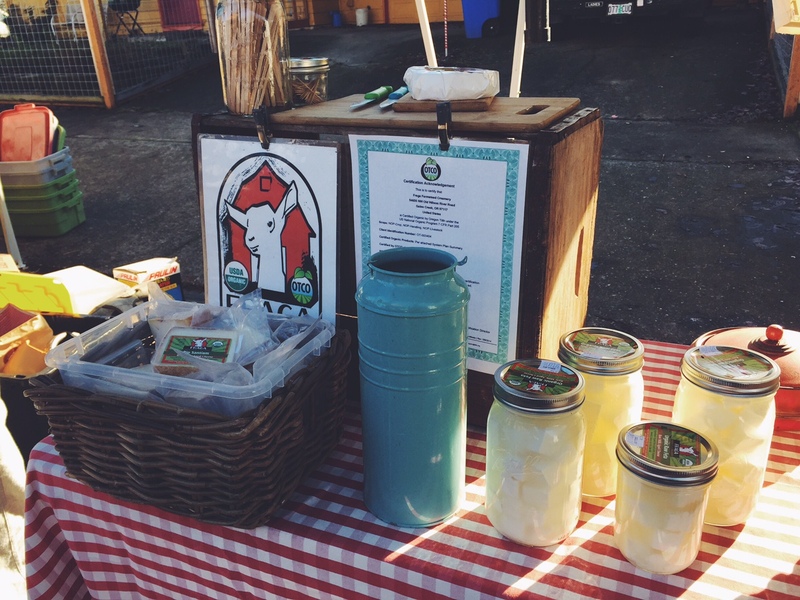 On the eve of this new year, 2016, I have helped milk close to 40 goats and worked a Portland Farmer’s Market, selling cheese made from those happy goats’ milk. I have been here for less than 48 hours and have already learned so much. I landed in Portland late Tuesday night. One of the farmers’ daughters picked me up from the airport and we drove 45 minutes West through patchy fog and suburbs. Although it was dark it was obvious when we reached the edge of the Tillamook State Forest; winding highways lined with large [evergreen or pine] trees. We were getting close to Gales Creek and Fraga Farmstead Creamery. We arrived and unloaded my gear. I am temporarily staying in a room off the side of the barn. I can look through the window between my room and the barn and see goats looking right back at me (a slice of my heaven). I will be moving up to the loft once a few of the current WWOOFers move on this weekend. This room with a goat view does have a purpose. During kidding season someone can sleep there and periodically peer through the window at the kidding pen where expectant mama’s rest and see if there are any new, fuzzy baby goats (also a slice of my heaven). When the sun rose the next morning, the foothills of the Oregon Coast Range welcomed the evasive sunshine. I met farmer Lis and we promptly got to work on feeding and milking. This was the highlight of my day. “The goats are a bit crabby,” she said. “It has been rainy and gloomy for days and the pastures have been too muddy. 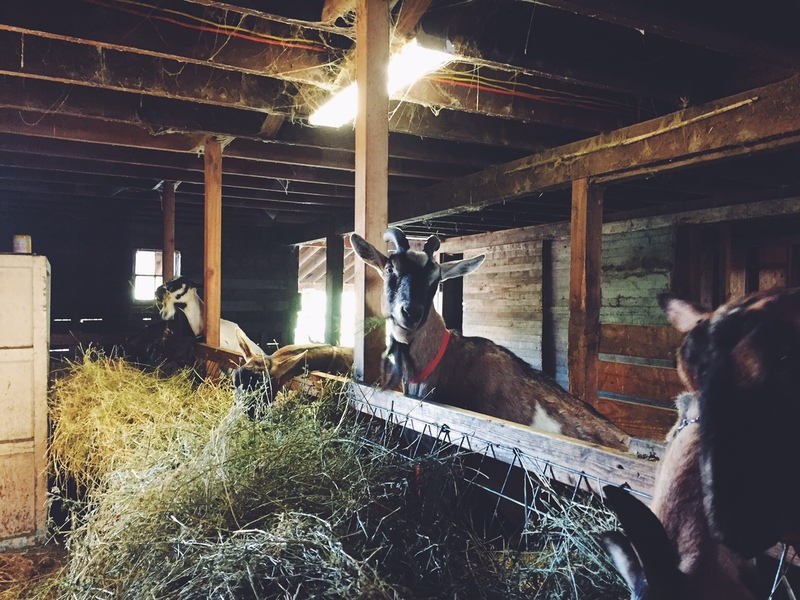 The goats have been cooped up in the barn. 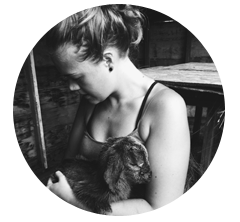 Goats hate rain.” I quickly day dream as I am reminded of the time I hid under a raised silo with our first two goats, Tullah and Coffee during a midsummer downpour. After 4 rounds of milking 8 goats at a time with their line system and bulk tank, we had 1 round left. We went in the goat pen to sort out the last few milkers and open up the barn gate to the pasture. “Watch this, they are going to go crazy,” said Lis. The big goats bolt to the pasture and sunshine, kicking and jumping as they go. The littles ones decided to take advantage of the open hay feeder and munch away, only to realize they didn’t like to be left alone and proceeded to run out to the sunshine and fellow goats. Seeing that many goats run to a hilly, tree filled pasture is something I will never forget. We finished the last round of milking and that afternoon and evening were spent at the People’s Co-op Farmer’s Market in Portland. It was fun to see and meet so many people. The WWOOFing concept is more widely known here so it was easy to explain that was I was a WWOOfer from North Dakota, here to learn more about goats and dairying so we can diversify our vegetable CSA back home. I thought I may get some funny looks. North Dakota, really? But instead I was met with kindness and curiosity. So many were happy to hear of the local food movement in North Dakota and the exciting changes we will see in 2016. I am so eager to continue to share my journey here in Oregon with all of my family, friends, and food community back home. Happy New Year!